This soup comes together in no time! Crunchy tortilla strips add some great texture for a perfect lunch or dinner. 1. Preheat the oven to 200 ºC (180 ºC for fan assisted ovens), gas mark 6. Place the tortilla strips onto an ungreased baking sheet and mist with cooking spray. Bake for 5 to 6 minutes or until golden brown and crunchy. Set aside to cool. 2. Meanwhile, heat the oil in a large non-stick saucepan and cook the onion over a medium heat for 5 minutes or until just softened. Pour in the enchilada sauce and chicken broth and bring to a boil. Turn down to a simmer, add the chicken and cook for 10 to 15 minutes, until the onion is tender and the chicken is fully heated through. Remove from heat, stir in the coriander and ladle into bowls. 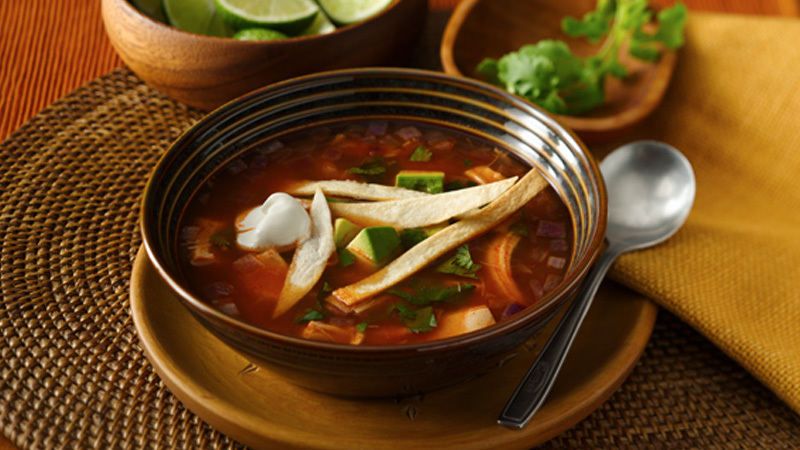 Serve garnished with the tortilla strips, soured cream and avocado. Great also served with some lime wedges for an extra zesty tang. Have leftover tortilla strips? Add them to a salad to add crunch!